I’ve been enamored of James van Pelt ever since reading his collection Strangers and Beggars, which I highly recommend. He’s a high school teacher as well as a writer, and as such school and teaching are elements that he returns to often. 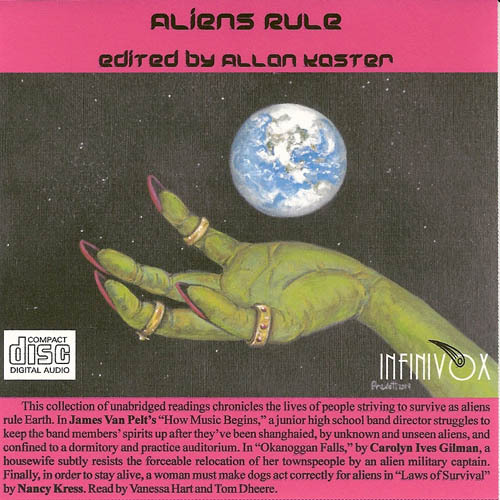 In this story, a teacher and his junior high music class are all held by aliens who observe them while they rehearse in an attempt to achieve the perfect performance. The teacher knows that perfection is elusive, and has to deal with the kids and their emotions on what seems to him to be an endless road trip. I loved the story – it rang true on every level. Carolyn Ives Gilman offers the story of a woman who, while the rest of the town she lives in is protesting a forced relocation, takes a different tack in protesting herself. She decided to try to get to know one of the aliens, and learns some surprising things. This story, the longest of the three, is a gem. A young girl is scavenging for food and ends up in one of the alien oppressor’s ships. There, she’s given the opportunity to train dogs in exchange for survival. She struggles to understand what the aliens are telling her and with the dogs, who had long since grew wild. Another great story from Nancy Kress. Tom Dheere and Vanessa Hart have the narration duties, and no complaints from me. Vanessa Hart’s narration of “Laws of Survival” was exceptional. Allan Kaster, the editor, told us that Infinivox will be publishing more collections in the future (as opposed to the single story releases they’ve done in the past), and I for one couldn’t be more pleased. This collection is well worth your time. 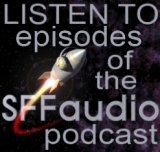 Check out The SFFaudio Podcast #036, which contains an interview of Allan Kaster, editor of the Infinivox line of science fiction audiobooks.